The ride last about two hours, taking you through the Dry Forest, the Salinas, the fresh water lagoon and pastures. You will see the salt pans and the natural pond. 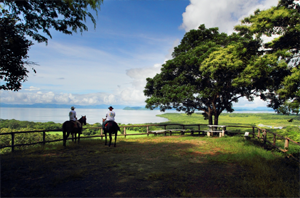 The view from the lookout over the Gulf of Nicoya is unforgettable. 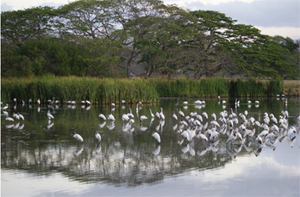 Along the way you will see varieties of birds, howler monkeys and crocodiles. We have horses for expert riders as well as for beginners. NO experience is required. What to wear: trousers, walking shoes, sun block and binoculars. 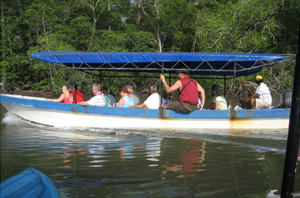 A tour of about two hours duration along the canals of the Abangares River. A visit to the mangrove forests, an important ecosystem. There are a great variety of birds and if you are lucky, you may see crocodiles, crab eating raccoons, and iguanas. What to wear: Shorts, walking shoes or sandals, binoculars, sun block, a hat. And don’t forget your camera!!! 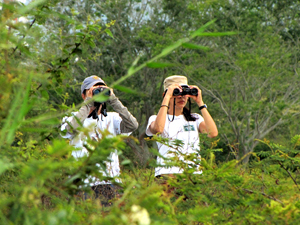 Enjoy the Dry Forest as well as the Mangroves along our various trails where you will see much bird and plant life. We have four marked trails through the different habitats of the reserve. Sendero Pescadores (Fishermen´s Trail): mangroves, water fowl. Sendero Salinas (Salt Pans Trail): Mangroves, water fowl and monkeys. Sendero Alcaraván (Curlew Trail): Dry forest. Sendero Mirador (Lookout Trail): The lookout is situated on the highest hill of the ranch. Ask for a trail map information regarding hiking times and distances. What to wear: trousers, Walking shoes (no sandals), sun block, binoculars and camera, and insect repellent. For those who prefer an easy ride around the ranch, we have developed a very unusual and creative way to enjoy the sights. 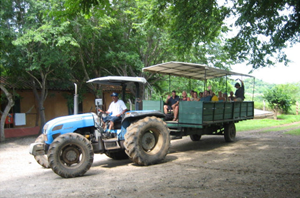 We build a long cart, pulled by a tractor, which will enable you to enjoy the Dry Forest and the pastures, with visits to the salt pans, the natural pond and spectacular view of the Gulf of Nicoya at sunset. Along the way you will see birds, howler monkeys and crocodiles. What to wear: trousers, walking shoes (no sandals), binoculars, camera and sun block. The tour leaves from the Lodge or from the Tempisque. The boat we use with capacity of people are very comfortable. The tour is through the Bebedero River where you can observe many varieties of birds such us: Crested Caracara, Common Black Hawk, Peregrin Falcon, Osprey, Laughing Falcon, Mangrove Swallow and many others. You will also see monkeys, crocodiles, iguanas and raccoons. During the tour that takes three hours, we will serve a drink. What to wear: Shorts, walking shoes or sandals, binoculars, sun block, a hat and don’t forget your camera.